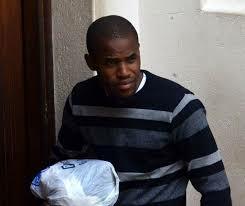 MURDER accused Rodney Tongai Jindu is living it up behind bars, B-Metro has learnt. He is in remand prison, having failed on numerous occasions to get bail. He is facing two counts for the murder of his childhood friend Cyprian Kudzurunga (28) and neighbour Mboneli Joko Ncube (30) before burying them in shallow graves. In refusing Jindu’s last get-out-of- jail bid, Bulawayo High Court Judge, Justice Nicholas Mathonsi said there was real danger the suspect could commit more murders. As such, the suspect has one option, that’s to make jail life bearable considering that he could possibly be in longer. A recently discharged inmate told B-Metro of Jindu’s lifestyle in the slammer. “He’s very particular about what to eat. In most cases he resorts to eating isitshwala and tinned foods such as beef and baked beans. I rarely saw him eat boiled vegetables or sugar beans (staple food in jail),” said the former inmate. Breakfast at the prison comes in form of white or sorghum porridge without sugar at 8am. Thereafter, inmates are served with quasi-lunch at 10.30 am before they go for an early supper at 2pm. Since Jindu is not a convict but a remand inmate he is allowed daily visits on week days. “At Khami Maximum Prison, convicted inmates are visited on Saturdays and Sundays between 9am to 3.30am and their family members are allowed to bring them tinned stuff. “Remand inmates are visited by their family members from Monday to Friday (9am to 3.30pm) and their family members are also allowed to bring them tinned stuff that includes beans, fish and beef,” Zimbabwe Prisons and Correctional Service (ZPCS) Bulawayo Metropolitan public relations officer, Principal Correctional Officer Garainashe Moyo said. Jindu is also said to have brought into jail his elegant dress code. “A sun hat is a must in his wardrobe. Not long ago he paid tailors (also prisoners) to make new outfits for him, “ added the former jail bird. The medium of exchange behind bars is soap, cigarettes and other groceries that one receives from outside. However, he does not take part in public events at the prison. “He usually keeps to himself reading magazines or chatting with a few elderly inmates,” said the source. While other inmates will seek to kill time by playing football, chess and other social activities, Jindu is yet to develop a hobby. “I never saw Jindu grace any of the football matches. Actually, there is an elected Khami Football Association board that runs both the Premier and Division One Leagues. Both leagues are made up of eight clubs each and matches are either played during the week or during weekend days,” said the source adding that Highlanders, Dynamos, Barcelona, Real Madrid and Medics are some the names that were accorded to clubs that make up Khami’s football family.